We have not seen the sun for almost 2 weeks, except for a brief period last week when I got out on the porch and did a little fall decorating. I didn’t get everything done, but I did put up this little polka dot pumpkin on the metal sign that we have on the porch. I had already painted this half-pumpkin red at the same time I was painting the repurposed closet doors on the porch. 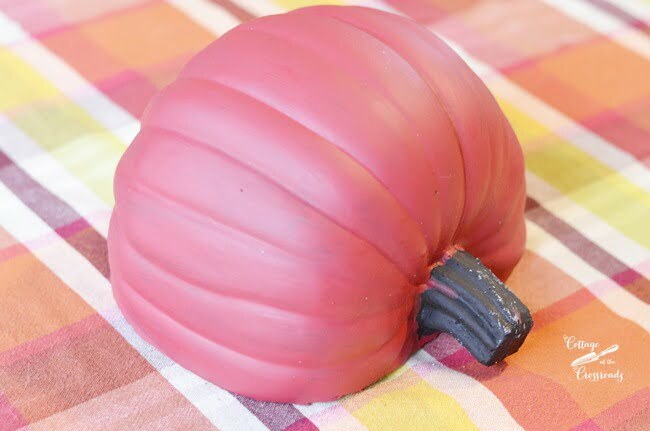 Do you know how easy it is to cut one of those inexpensive pumpkins in half? This one used to be black, and you can see it here in our fall kitchen 2 years ago. 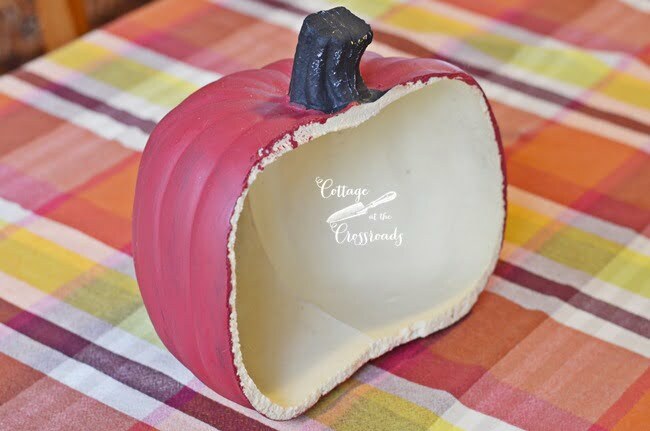 It’s an easy way to put a pumpkin in a place where a round one won’t fit. 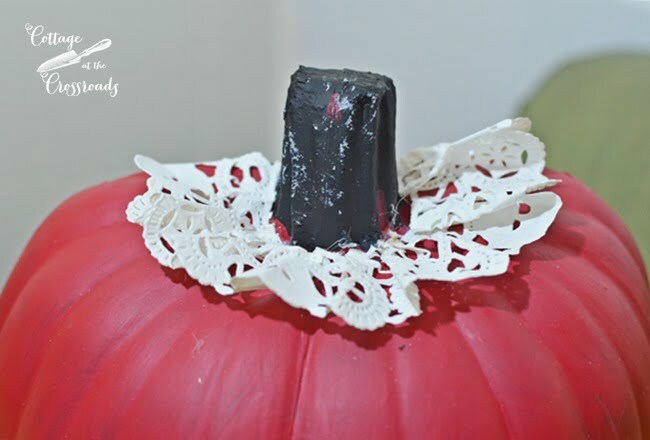 I decided that the red pumpkin needed a little something more, so I got out a real doily, thinking that I would cut a hole in it to make it fit around the stem. But after some thought, I couldn’t cut someone’s handwork like that. 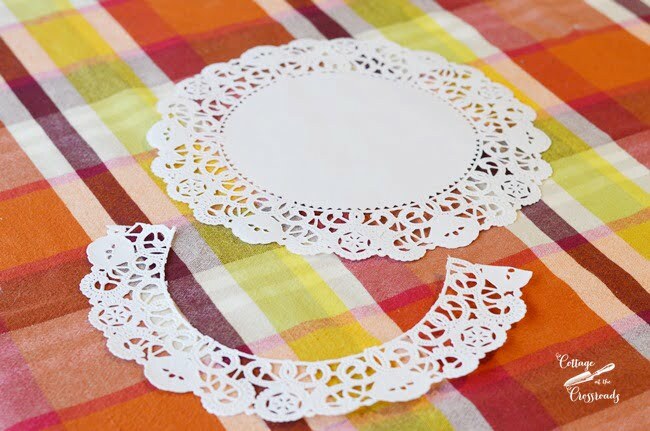 So I got out some paper doilies and proceeded to cut off the edge. 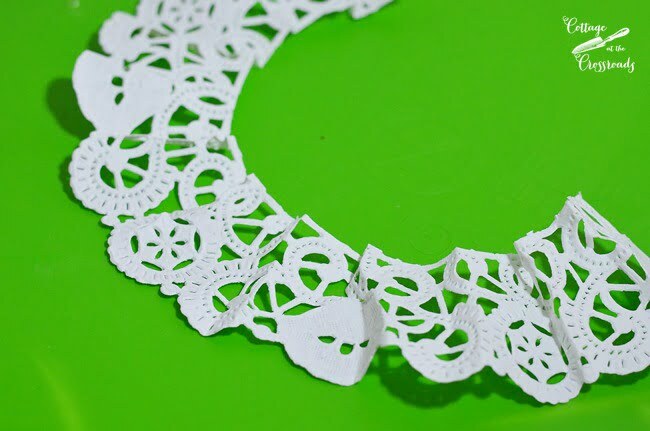 To make it fit around the stem, I made little folds in the doily as you can see in this photo. Hot glue kept the folds in place and the piece that I had cut fit perfectly. So I was thinking that the red pumpkin still looked a little “plain,” so I proceeded to paint some white polka dots all over it. Ta-Da! What is it about polka dots that make people smile, especially when it is a polka dot pumpkin? I attached it to the vintage metal sign that we have on the porch, and I have a little more work to do to it so I can’t show you the whole thing yet. Since painting the repurposed closet doors red, I decided to go whole hog red on the porch for fall. 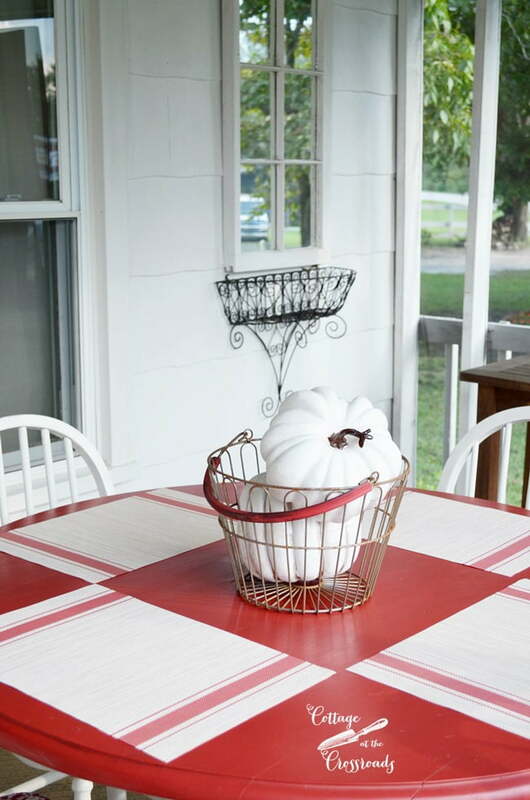 And I started putting out some things like these new placemats and the basket with the white pumpkins. I quickly put together this wreath for the door, but I can’t show you the whole things because I want to rearrange a few things on it. 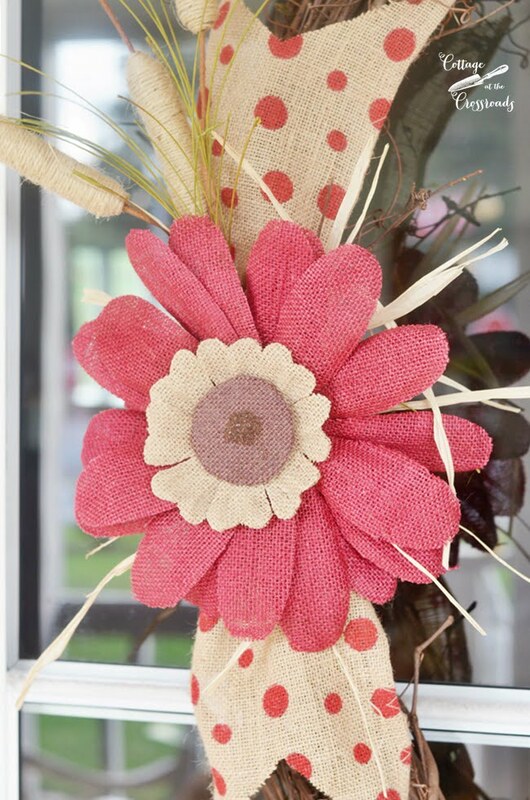 But you can see how it’s going to be a polka dot world on the porch this year, can’t you? Rascal came over to check out what I was doing. Well, these decorations were on the porch just long enough for me to get some photos because the next day we had to prepare the porch for the expected, unprecedented amount of rainfall that was going to hit the Southeast. All the cushions and other decorations were put away before the storm hit. We received about 17 inches of rain in less than 24 hours. It was a scary and nerve-wracking time, not knowing how high the water would rise. Our greatest concern was about water seeping into my mom’s apartment in the backyard since it is on a slab. It was very close but luckily the rain subsided for several hours. Other people in our state were not so lucky. So I am counting my blessings that our little cottage is dry and safe. I’ll be back soon to show you more of the porch. The sun is supposed to come out tomorrow! Yay! 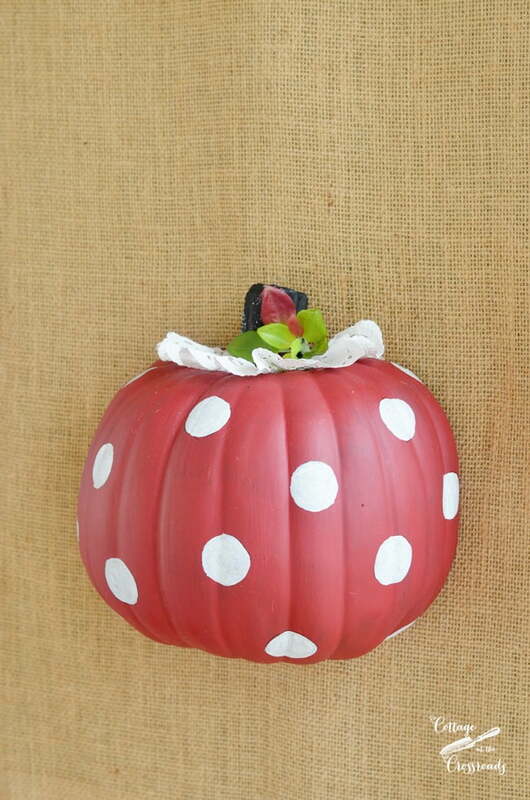 Never would have thought to paint a pumpkin red with polka dots but, I love it! I just signed up to receive your blogs. 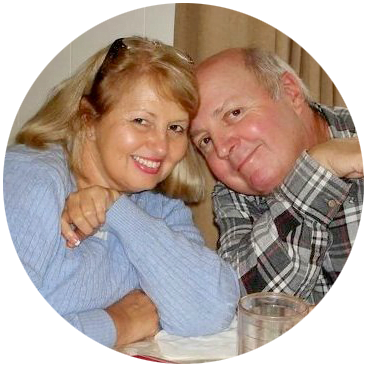 I love your website – it’s gorgeous and defined so well that it is easily traveled. Your talent is to be admired! 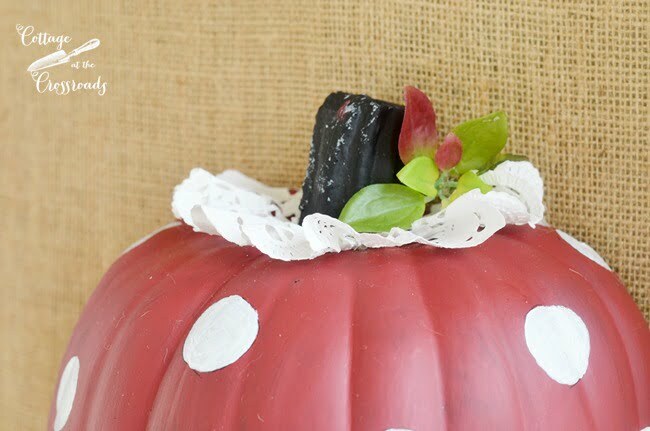 Love the polka dot pumpkin! Will use that next year – maybe at Christmas! Embellishments lend a pumpkin for all seasons! 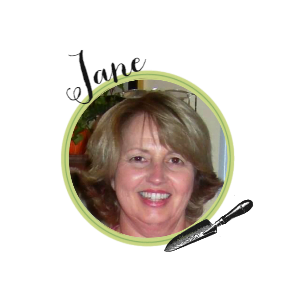 How cute Jane. 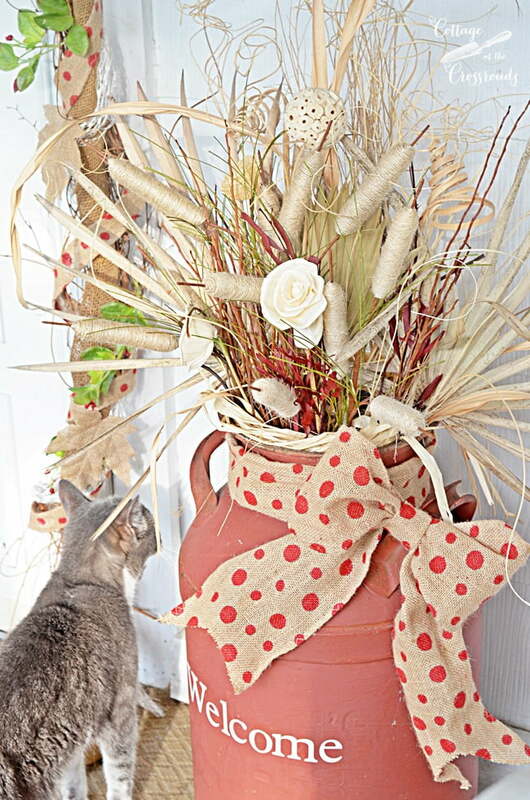 I love all the pops of red and the twine cattails are a brilliant idea. Thank goodness you remained safe. Cute!! Everything’s better with polka dots! Cute Jane, Waiting for the finished porch. They are always inspiring. Your polka dot pumpkin is darling and I like your milk can arrangement. Thank goodness y’all are ok and the rain has stopped. Super cute with the dots. I am praying the sun will be back here tomorrow.